[Translate] If you want of some tiny bit of solace from the craziness of SoHo, there’s Altesi Downtown. This Italian (Tuscan cuisine, to be a little more precise) restaurant is spacious and even though it has a fair amount of diners, it never gets too loud while we were dining there on a recent evening. The dining room features an elevated platform that can open to the street, offering quick alfresco dining. Meanwhile, further to the rear, a wine wall dominates the back of the restaurant as the seats transition into more of a cozy vibe. Visible from all seats..
[Translate] I’ve recently traveled to Rome and Florence, Italy! Both cities were great and they definitely have different personalities despite both places have a lot of pride for their city. The posts I will be putting up are going to be in relative random order rather than chronological. 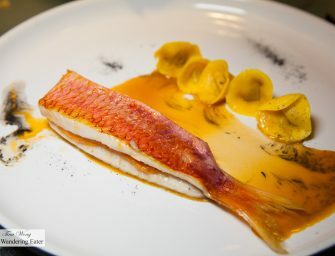 I will start off with a very good, creative dinner at Glass Hostaria led by its chef and proprietor Cristina Bowerman. Almost as renowned for its design as it is for its food, Glass Hostaria is a culinary fixture of the historic alleyways of Rome. 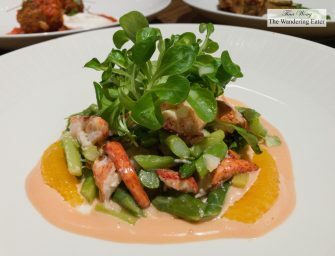 The restaurant itself is a wonderful mix..
[Translate] Chef Emilio Barbieri & Chef Cesare Casella; the menu and the bar/dining room area A few nights ago, Chef Cesare Casella and Chef Emilio Barbieri cooked together at Chef Casella’s latest restaurant Il Ristorante in the Upper East Side. (This special one-night dinner is $110 per person.) Chef Barbieri is the executive chef of the 1* Michelin restaurant Strada Facendo in Modena, Italy. His style of cooking is taking flavors and scents of his childhood in Reggio Emilia and make it contemporary. This special collaboration occurred primarily for Mondo Lambrusco, an annual event to promote Lambrusco wines (a young..
[Translate] Osteria Morini’s exterior, Chef/Co-Owner Michael White & Hand Carving 30-month aged prosciutto di Parma Prosciutto di Parma threw their 50th Anniversary party at Osteria Morini. Magnum bottles of Fattoria Paradiso Sangiovese di Romagna 1993, Various cocktails, Pecorino Dolce and my plate of Prosciutto di Parma Since this is a prosciutto party, almost everything served have touches of that beloved, cured Italian ham – even the cocktails and desserts. The Melone e Prosciutto cocktail is composed of melon infused El Dorado Rum, Cocchi Americano, Elcone Sherry, melon purée, with a smoked salt and Prosciutto rim. Initially salty and crunchy from..
[Translate] Interior of Salumiera Rosi The weekend after New Year’s, I thought of reconnecting with a few friends I’ve missed over the holidays. Discussing where we should have brunch, I found out one of my friends recently moved to the Upper West Side, just steps away from Salumeria Rosi. * Salumeria Rosi is a small neighborhood salumi shop found right at the entrance and it shares the space of the 30-ish seat restaurant. In the middle of the restaurant it has an interesting, primarily white carving except the colored portions were the hams and salumi. This restaurant (and its newer Upper..
[Translate] Chió’s Exterior, Main dining room interior, Garden area, and the menus Chió (pronounced kee-OH) is located on the Waterfront District of Brooklyn that mainly focuses on rustic Italian fare, opened in August 2012. 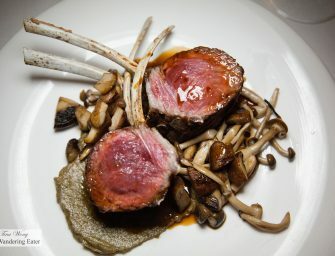 Unlike most restaurants, co-owner Chef Alex McWilliams created a menu that has hints of proteins (meats and fish) rather than focusing on it. Their wine menu (no hard liquors and spirits served) is focused on biodynamic, sustainable and organic offerings that place a strong emphasis on the growing and harvesting process. These handcrafted products are sourced from boutique producers who are passionate about their craft and..
[Translate] Executive Chef Jarett Appell at the blinged-out pizza oven & the restaurant’s interior This past Thursday, I had a delicious lunch at Donatella in Chelsea, New York with a group of friends. This is a casual Italian restaurant owned the well-known restaurateur and television personality, Donatella Arpaia. You probably might have heard of the famous blinged-out oven (as seen on Slice) that looks like a gold disco ball but it’s functional and built by Napoli’s best oven-crafters, Stefano Ferrara. Her executive chef Jarett Appell is creating delicious food and excellent Neapolitan-style pizzas that would make a pizza purist and..